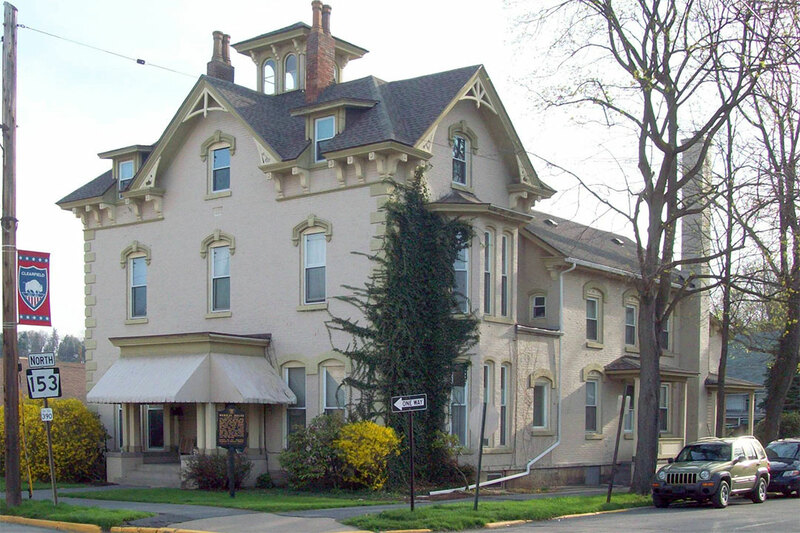 Clearfield Borough Hall is located at 6 South Front Street, Clearfield PA 16830; phone: 814-765-7817. Photo: Thomas Murray House, ca. 1876, 120 South Second Street, Clearfield, PA. Listed on the National Register of Historic Places in 1979. Photographed by User: Pubdog (own work), 2010, [cc-by-1.0 (creativecommons.org/publicdomain/zero/1.0/deed.en)], via Wikimedia Commons, accessed May, 2015. Clearfield, county seat; population 8529; on land owned by Abraham Witmer, laid out, 1805, in regular squares like Philadelphia; streets running east and west are named, those north and south numbered. Two small parks were reserved along the West Branch. Principal buildings are scattered. Courthouse, brick, Romanesque, built in 1860, architects, Cleveland & Bachus, contains portraits of former judges, among them Honorable John Holden Orvis; it is located in center of the original plan of the borough. Near are most of the churches, of which the Trinity Methodist Episcopal, Romanesque, and St. Francis' Roman Catholic, Gothic, may be mentioned for architecture. The high school is well lighted and of best school construction; each of the principal towns of this county has its high school. Prominent men of Clearfield were, Honorable William Bigler, State Governor, and Honorable William A. Wallace, United States Senator; they are buried in Hillerest Cemetery; a monument to Governor Bigler was erected by the state.